For RHEL 7 Server you can target the “Server with GUI” group instead. After installing the appropriate packages, change the default systemd boot target to graphical.target. If you run into any errors, try updating the system first with ‘yum update‘. After installing the appropriate packages, modify the default runlevel as defined in the /etc/inittab file. Run the following command to do so. This will change the system’s default runlevel from runlevel 3 to runlevel 5, which will boot the system to the GUI login screen by default. Finally, switch the system to runlevel 5 by running the command ‘init 5‘. If you wish to start the GUI in single-user mode, run the command startx from runlevel 3. In this method you have to select Desktop mode while installing the operating system itself. So thie method is only valid if you have not installed the OS yet. 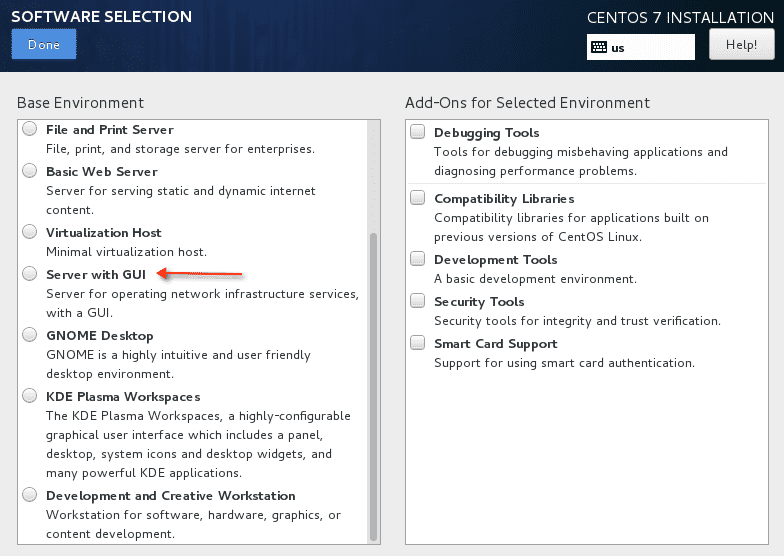 Select “Server with a GUI” for RHEL 7 as shown in the diagram below. Check to see what groups of packages are available from repository. For graphical interface purposes, focus on “X Window System” and either “GNOME Desktop Environment” (just called “Desktop” in RHEL 6) or “KDE (K Desktop Environment)“.